The 13 Dunny Series Trailer 1 & 2!!! We are excited to reveal what Brandt Peters & his team have been working on! Check out the teaser trailer for “The 13”! Coming Oct. 16th! Kidrobot and Brandt Peters are excited to announce the release and release party of the first Dunny series in over a year, The 13!!!!!! If you do… Join Kidrobot, Brandt Peters and Kathie Olivas on Friday, October 16th for The 13 Dunny Series release party and signing at 3D Retro! We’ll have food, door prizes and The 13 Dunny series available for purchase! As an event special, a limited amount of chase pieces will be given with a purchase of the full case. This event will take place at 3D Retro in Glendale, CA from 7pm-9pm. Come meet Brandt and Kathie while picking up an epic new series of Dunnys! From award winning, contemporary toy artist Brandt Peters comes The 13; Kidrobot’s latest Dunny Series. 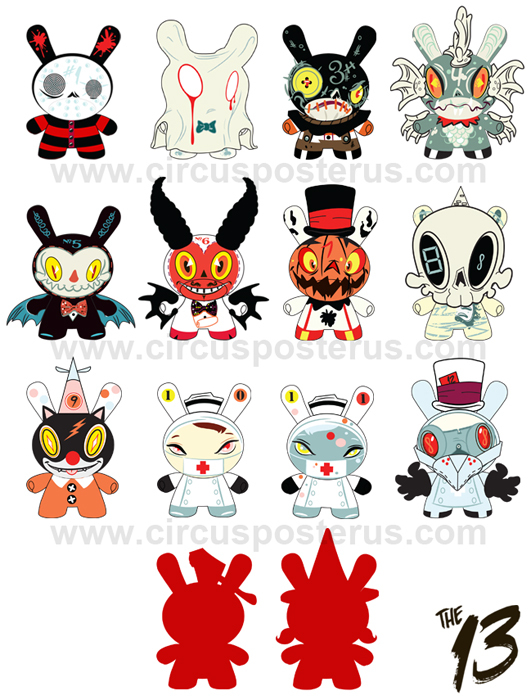 “The 13” features thirteen evil Dunny souls providing a history lesson in the macabre based on classic All Hallows’ Eve tropes and vintage horror exploitation cinema icons, with feminine frights designed by none other than Kathie Olivas. Legend has it that a shady eccentric by the name of Lord Strange opened up the 13th dimension one blood moon, and in so doing filled his demented 13 floor mansion, Infernal Manor, with beasts, creatures and monstrosities of every type. Lord Strange was never seen again…his lair abandoned and sealed from the public since that horrific evening. None brave enough to venture into Infernal Manor has ever returned to tell their tale. Do you dare seek The 13? Help support the artist directly by buying through Circus Posterus! One random figure per blind box. 20 blind boxes per display case. Case orders come with a small 5×7” original sketch by Brandt Peters (Limit one per household). This is a pre-order item with a pre-order discount. You are paying in full for an item that is estimated to be available for shipping in Fall 2015. Shipping schedule subject to change.